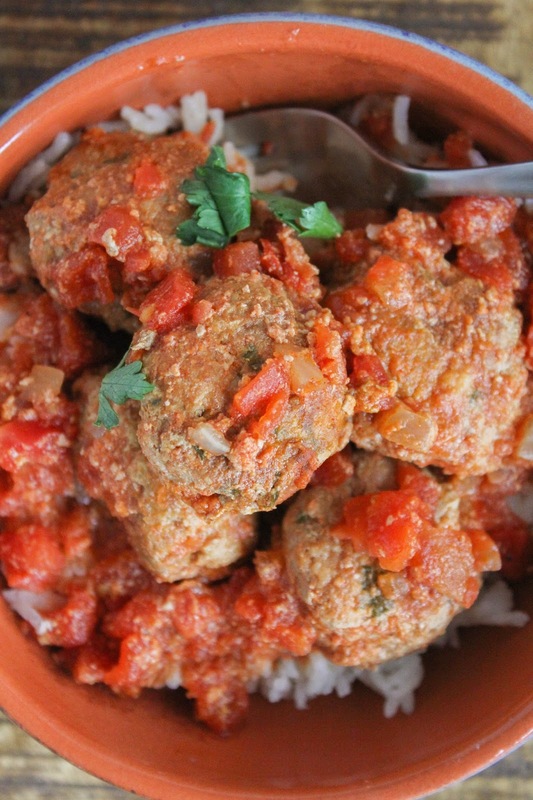 Take a trip to Spain with these rich and flavorful turkey meatballs. Nestled in a simple tomato sauce, cooking them in the slow cooker keeps them super tender. 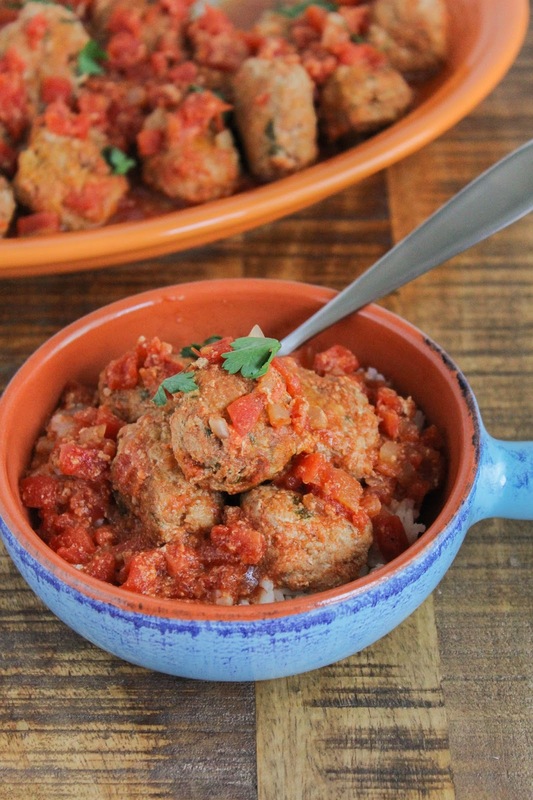 Serve the meatballs over rice for a quick and easy weeknight dinner! I know I've mentioned this before, but I love my slow cooker. Being able to pop everything into it in the morning and have dinner ready at 5:30 is such a lifesaver some days. I can't tell you how many times I've went to my frig at 5:00 wondering what to make for dinner. When you plan ahead and make a slow cooker meal, all of that wonder and worry is gone! I created these flavorful and delicious Slow Cooker Spanish Meatballs for this weeks' Sunday Supper. Can you guess this weeks' theme? Well it's MEATBALLS of course! And who doesn't love a good meatball? I am amazed at the variety of recipes that my Sunday Supper friends have come up with. We've got everything from Italian to Thai to Moroccan and even vegetarian recipes! Find the entire list of delicious meatballs at the end of this post. For now, let's get back to these Spanish meatballs. Using ground turkey keeps this dish light and healthy. Adding smoked paprika, cumin, and fresh parsley gives the meatballs incredible flavor. 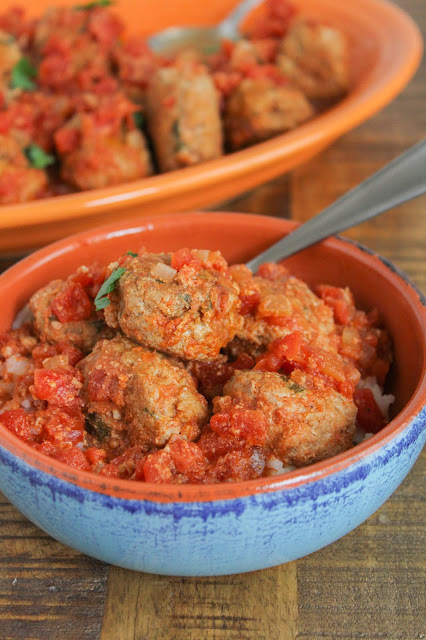 The meatballs are nestled in a simple tomato sauce and cooking them low and slow makes them incredibly tender. They seriously melt in your mouth! 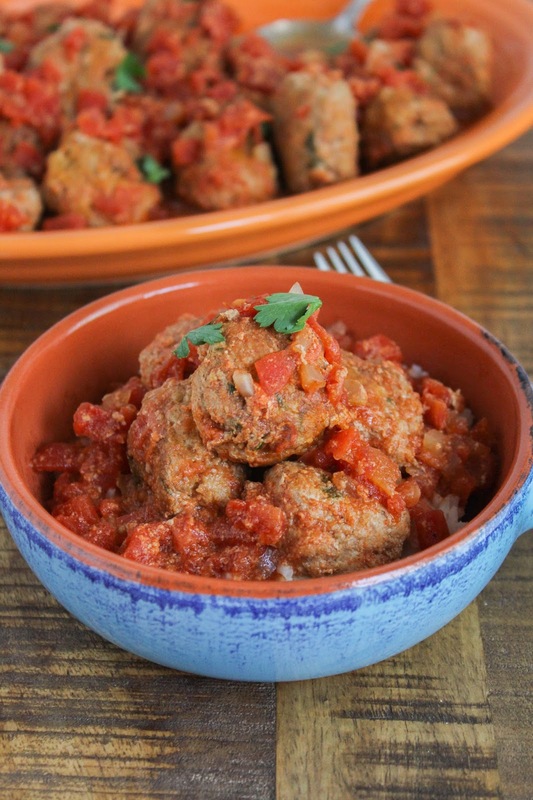 These meatballs are delicious over white rice, but they would great over egg noodles, too. Served them with a side salad and some crusty bread and dinner is ready in to time! In a large bowl, combine the turkey, 1/4 cup of the onion, breadcrumbs, parsley, 1 1/2 teaspoons paprika, cumin, salt, pepper, and eggs. Using your hands, or a wooden spoon, gently mix everything together to combine. Use your hands to roll the mixture into about 28 meatballs. In a large nonstick skillet over medium-high heat, add the olive oil. Working in batches, brown the meatballs on all sides. Add the remaining 1/4 cup of onion, 2 teaspoons of paprika and the diced tomatoes to the slow cooker. Sprinkle with salt and pepper and stir to combine. Place the meatballs into the slow cooker on top of the sauce. Cook on low for 4-6 hours, until the meatballs are tender. Serve over rice, if desired.